This article is about the artistic movement. For the use of the term in computer graphics, see Photorealistic rendering. John Baeder, oil on canvas, 30×48 inches. Pop Art and Photorealism were both reactionary movements stemming from the ever-increasing and overwhelming abundance of photographic media, which by the mid 20th century had grown into such a massive phenomenon that it was threatening to lessen the value of imagery in art. However, whereas the Pop artists were primarily pointing out the absurdity of much of the imagery (especially in commercial usage), the Photorealists were trying to reclaim and exalt the value of an image. The word Photorealism was coined by Louis K. Meisel in 1969 and appeared in print for the first time in 1970 in a Whitney Museum catalogue for the show "Twenty-two Realists." It is also sometimes labeled as Super-Realism, New Realism, Sharp Focus Realism, or Hyper-Realism. The Photo-Realist uses the camera and photograph to gather information. The Photo-Realist uses a mechanical or semimechanical means to transfer the information to the canvas. The Photo-Realist must have the technical ability to make the finished work appear photographic. The artist must have exhibited work as a Photo-Realist by 1972 to be considered one of the central Photo-Realists. The artist must have devoted at least five years to the development and exhibition of Photo-Realist work. Photorealist painting cannot exist without the photograph. In Photorealism, change and movement must be frozen in time which must then be accurately represented by the artist. Photorealists gather their imagery and information with the camera and photograph. Once the photograph is developed (usually onto a photographic slide) the artist will systematically transfer the image from the photographic slide onto canvases. Usually this is done either by projecting the slide onto the canvas or by using traditional grid techniques. The resulting images are often direct copies of the original photograph but are usually larger than the original photograph or slide. This results in the photorealist style being tight and precise, often with an emphasis on imagery that requires a high level of technical prowess and virtuosity to simulate, such as reflections in specular surfaces and the geometric rigor of man-made environs. The first generation of American photorealists includes such painters as John Baeder, Richard Estes, Ralph Goings, Chuck Close, Charles Bell, Audrey Flack, Don Eddy, Robert Bechtle, and Tom Blackwell. Often working independently of each other and with widely different starting points, these original photorealists routinely tackled mundane or familiar subjects in traditional art genres--landscapes (mostly urban rather than naturalistic), portraits, and still lifes. In the UK, photorealist approaches were favoured by many artists including Mike Gorman and Eric Scott. The introduction of these European painters to a wider US audience was brought about through the 1982 'Superhumanism' exhibition at the Arnold Katzen Gallery, New York. Though the movement is primarily associated with painting, Duane Hanson and John DeAndrea are sculptors associated with photorealism for their painted, lifelike sculptures of average people that were complete with simulated hair and real clothes. They are called Verists. Though the height of Photorealism was in the 1970s the movement continues and includes several of the original photorealists as well as many of their contemporaries. According to Meisel and Chase's Photorealism at the Millennium, only eight of the original photorealists were still creating photorealist work in 2002; ten including John Baeder and Howard Kanovitz. Artists Charles Bell, John Kacere, and Howard Kanovitz have died; Audrey Flack, Chuck Close, and Don Eddy have moved away from photorealism; and Robert Cottingham no longer considers himself a photorealist. Newer Photorealists are building upon the foundations set by the original photorealists. Examples would be the influence of Richard Estes in works by Anthony Brunelli or the influence of Ralph Goings and Charles Bell in works by Glennray Tutor. However, this has led many to move on from the strict definition of photorealism as the emulation of the photograph. Photorealism is also no longer simply an American art movement. Starting with Franz Gertsch in the 1980s Clive Head, Raphaella Spence, Bertrand Meniel, and Roberto Bernardi are several European artists associated with photorealism that have emerged since the mid-1990s. 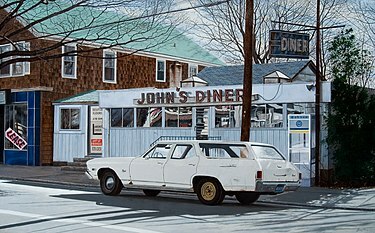 This internationalization of photorealism is also seen in photorealist events, such as The Prague Project, in which American and non-American photorealist painters have traveled together to locations including Prague, Zurich, Monaco and New York, to work alongside each other in producing work. The evolution of technology has brought forth photorealistic paintings that exceed what was thought possible with paintings; these newer paintings by the photorealists are sometimes referred to as "Hyperrealism." With new technology in cameras and digital equipment, artists are able to be far more precision-oriented and can produce imagery using a wider range of media. The artist Bill Fink has developed his own technique for creating photorealistic images using soil, pollen, human hair, and cremated human remains. Photorealism's influence and popularity continues to grow, with new books such as Juxtapoz's 2014 book entitled Hyperreal detailing current trends within the artistic genre. ^ a b Lindey (1980), pp. 27–33. ^ a b c Meisel and Chase (2002), pp. 14–15. ^ a b c Nochlin, Linda, "The Realist Criminal and the Abstract Law II", Art In America. 61 (November–December 1973), p. 98. ^ a b Fleming, John and Honour, Hugh (1991), The Visual Arts: A History, 3rd Edition. New York: Abrams. p. 709. ISBN 0810939134. ^ Meisel and Chase (2002), pp. 11–12. ^ a b Scharf, Aaron (1969), Art and Photography Baltimore: Allan Lane, The Penguin Press. ^ Meisel and Chase (2002), pp. 11–14. ^ a b c d Lindey (1980), p. 12. ^ Lindey (1980), p. 23. ^ a b Chase, p. 14. ^ a b c Meisel (1989), p. 12. ^ a b Meisel (1980), p. 13. ^ Meisel (1980), p. 14. ^ Meisel (1980), p. 15. ^ Meisel and Chase (2002), p. 8. ^ Steve Greenberg (2 June 1992). "Photo Realism: Artist Bill Fink uses human ash to create a visual AIDS memorial". The Advocate. No. 604. pp. 80–81. ^ Phillips, Stephen Bennett and Spoutz, Eric Ian Hornak (2012), "Ian Hornak Transparent Barricades," exhibition catalogue, Washington D.C.: Board of Governors of the Federal Reserve System, Fine Art Program. p. 28. ^ Adan, Joan and Spoutz, Eric Ian Hornak (May 2012), "Transparent Barricades: Ian Hornak, A Retrospective," exhibition catalogue, Glendale, California: Forest Lawn Museum. pp. 1–3. ^ "James Torlakson, William Farley · SFMOMA". sfmoma.org. Retrieved 2017-06-09. ^ Rose, Joshua (November 2008), "Beyond Perception" American Art Collector Magazine, pp. 154–158. ^ Pill, Steve (December 2007), "Photorealism", Artists and Illustrators Magazine London. Issue number 255. ^ Gibson, Eric (1999), Outward Bound: Contemporary American Art. Lunenburg, Vermont: Stinehour Press Publishers. ^ New Photorealists, Louis K. Meisel Gallery, New York 2004. ^ Newton, Matthew (March 2008) "Los Angeles-bred Photorealist Robert Standish manipulates reality with the strokes of his brush". JUXTAPOZ. pp. 112–122. Auping, Michael; Bishop, Janet; Ray, Charles; and Weinberg, Jonathan (2005), Robert Bechtle: A Retrospective. Berkeley, California: University of California Press. ISBN 978-0-520-24543-3. Chalumeau, Jean-Luc (2007), Peinture et Photographie: Pop art, figuration narrative, hyperréalisme, nouveaux pop. Paris: Editions du Chêne. ISBN 978-2-84277-731-9. Chase, Linda (1988), Ralph Goings: Essay/Interview. New York: Abrams. ISBN 978-0-8109-1030-0. Chase, Linda (ed.) (2001), Photorealism: The Liff Collection. Naples, Florida: Naples Museum of Art. ISBN 978-0-9705158-1-0. Geldzahler, Henry and Meisel, Louis K. (1991), Charles Bell: The Complete Works, 1970-1990. New York: Abrams. ISBN 978-0-8109-3114-5. Meisel, Louis K. (1989), Photorealism. New York: Abradale/Abrams. ISBN 978-0-8109-8092-1. Meisel, Louis K. (1993), Photorealism Since 1980. New York: Abrams. ISBN 978-0-8109-3720-8. Meisel, Louis K. and Chase, Linda. (2002), Photorealism at the Millennium. New York: Abrams. ISBN 978-0-8109-3483-2. Meisel, Louis K. and Perreault, John (1986), Richard Estes: The Complete Paintings, 1966-1985. New York:Abrams. ISBN 978-0-8109-0881-9. Paraskos, Michael (2013), Scarborough Realists Now. London: Orage Press. ISBN 978-0-95658-024-5. Paraskos, Michael (2010), Clive Head. London: Lund Humphries. ISBN 978-1-84822-062-1. Wilmerding, John (2006), Richard Estes. New York: Rizzoli. ISBN 978-0-8478-2807-4.